Experience an exciting day tour of Niagara Falls, the largest waterfall in the world by the volume of whopping water siphoned at an average of 750,000 gallons per second. 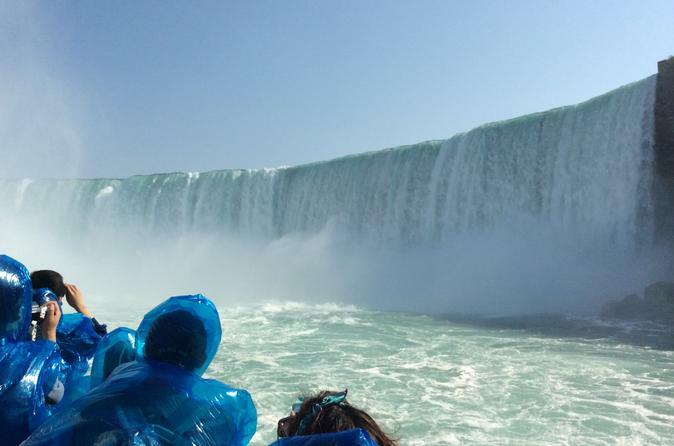 On this 7 to 8-hour private tour, visit all of the points of interest on the Canadian side of the Falls , including the Whirlpool Rapids and Goat Island, Horseshoe Falls and many more sights. One of the highlights of this trip is the Niagara Falls Hornblower Boat Ride (only during summer months, as the cruise is closed December through April due to ice). Discover the magic of the Niagara Falls. Discover the magic of the Niagara Falls. Our tour takes you through the Upper Niagara River where our tour guides recount the history of Niagara Falls and give you facts and stories about the landmarks. Scenic drive with Picture stops at many places. It is customized, so you can have your own itinerary if you wish. What could be better than a tour of Niagara Falls in a Lincoln Town Car? With your own personal driver guide, see Niagara Falls at your own pace. Your 8-hour tour begins with complimentary pickup from your hotel in Toronto. From there, the drive to Niagara Falls is about 90 minutes. Your fully qualified and highly experienced driver will take you through the streets of Niagara-on-the-Lake and Niagara Falls. Ask your driver to take you along a route specially chosen by you. Or let your driver guide you around instead, stopping off at the major sights and stopping on request to take photographs. For the third leg of the tour, board the Hornblower Boat Cruise (seasonal from April to November) and afterwards, drive towards Niagara-on-the-Lake and explore this quaint town.